Two reasons for me to want to read this book…firstly it’s set in Scarborough where I lived for a few years as a student and I have deep affection for and secondly, it involves cake. Getting a review copy was a total plus for me! 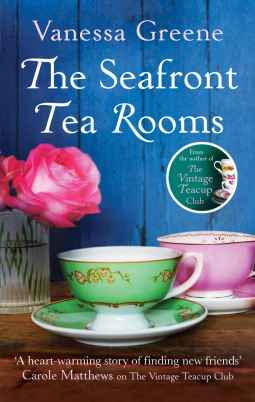 Letty is the owner of The Seafront Tea Rooms, a beautifully old fashioned place which provides comfort, excellent tea and delicious cakes to the selection of characters that find friendship and new purpose to their lives through their visits to this old-fashioned haven. Three very different women come together; single mum Kat trying to do her best for her young son whilst managing the demands of her ex, career driven Charlie who sets herself up with a demanding work project whilst mopping up the domestic mess her sister inhabits and French au pair Seraphine running away from the pressures of balancing her family’s expectations and the love of her life. Although it’s fairly predictable, it was a pleasure to wallow in beautiful descriptions of confection and to reminisce about Scarborough and the surrounding areas. It’s an undemanding, enjoyable, cosy read about new friendships, difficult relationships and baking. There’s a fair few books out there with covering the same themes, but it’s nicely done and worth a look. Thanks to netgalley and Little, Brown for my review copy.